Dr. Peter Simon was appointed President of The Royal Conservatory in September 1991, a time when the venerable Canadian institution founded in 1886 was re-emerging as an independent entity and faced substantial financial, operational and program challenges. Since that time Dr. Simon has led a dynamic transformation of the programs and facilities of The Royal Conservatory resulting in a dramatic expansion of the number of participants, earned and donated revenues, endowment funds, and scholarship support for students. Today the broad array of RCM programs is used by 500,000 people annually. When first appointed Dr. Simon sought to create a climate in Canada in which the arts were broadly recognized as an important means of furthering the personal, intellectual, and social development of all people. He firmly believed that the arts were the best means available to foster creativity and innovative thinking in all areas of endeavour, and that this made them an indispensible element in the future social and fiscal success of our nation. Ultimately, he sought to promote a society in Canada in which the arts were a central part of the daily lives of all people and viewed as an integral element of a fulfilled life. As a consequence in 1991 the mission of The Royal Conservatory became to develop human potential through music and the arts. Through this expanded mission Dr. Simon initiated a series of steps which would re-define the role of a Conservatory in society, one which offered the highest levels of excellence in performance and instrumental training but also developed, distributed, and offered a wide range of arts based programs which fostered human development. Over the past decade, The Royal Conservatory has set in motion a series of far-reaching and evolutionary changes in the role of arts organizations and their ability to affect society. In 1994, Dr. Simon launched Learning Through The Arts® (LTTA), a new division of the RCM. This ambitious educational initiative sought to put the arts at the centre of public education and create a systematic means by which teachers could use arts-based techniques to instruct the core curriculum and enhance the academic, social and emotional growth of students. Since its inception more than 300,000 students in over 300 schools and communities have benefitted from this program. A 2002 national study conducted by researchers at Queen’s University found that students in the LTTA program scored 11 percentile points higher in mathematics test scores than peers in non LTTA Schools. LTTA programs have been developed for areas with high concentrations of indigenous peoples. The LTTA system has been implemented in a number of international settings including Germany and Sweden. 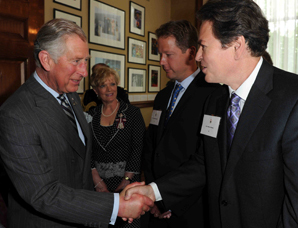 In 2013 through the support of the Prince’s Charities of Canada and HRH The Prince of Wales, LTTA techniques were introduced in the UK. In 2015 an LTTA project in Fort McMurray led to substantial provincial test score gains especially by Indigenous students. More than 45 studies on the effects of the LTTA program have shown quantifiable benefits to students, teachers, principals, and LTTA Artist-Educators. Most recently LTTA has focused on the development of arts based digital tools for use in schools. Dr. Peter Simon speaking to guests at the 2017 Season Gala. 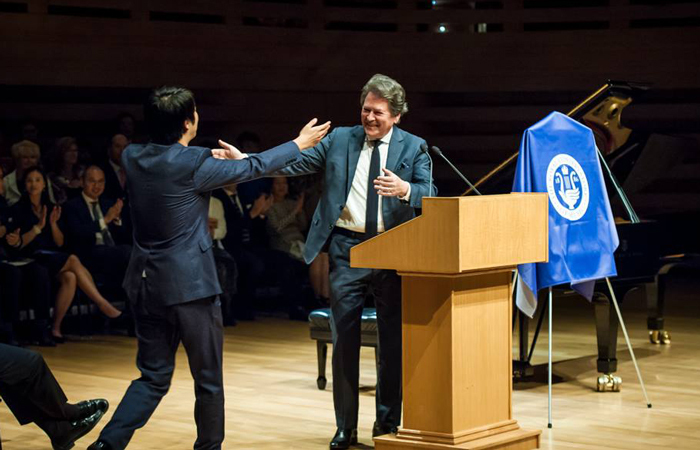 Dr. Peter Simon with piano virtuoso Lang Lang. 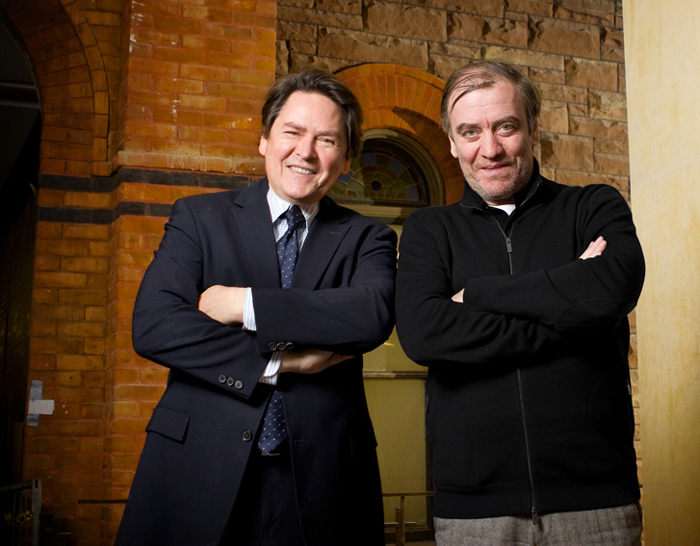 Dr. Peter Simon with Maestro Valery Gergiev. 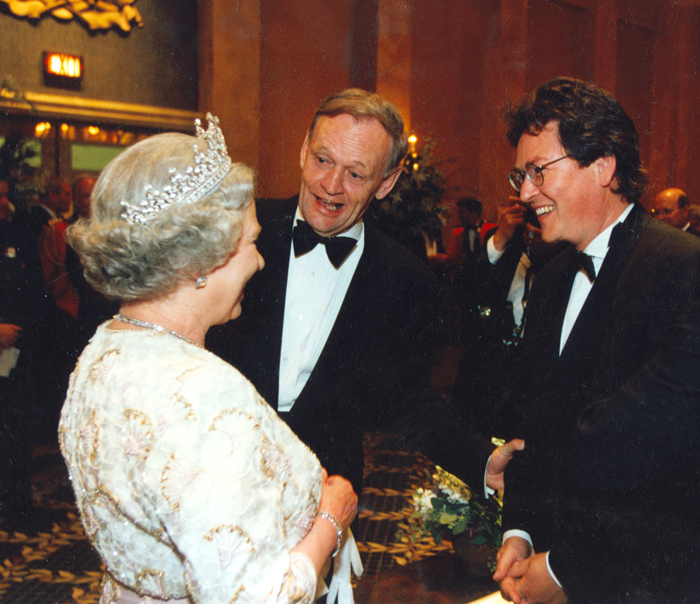 Queen Elizabeth II, The Right Honourable Jean Chrétien, and Dr. Peter Simon. 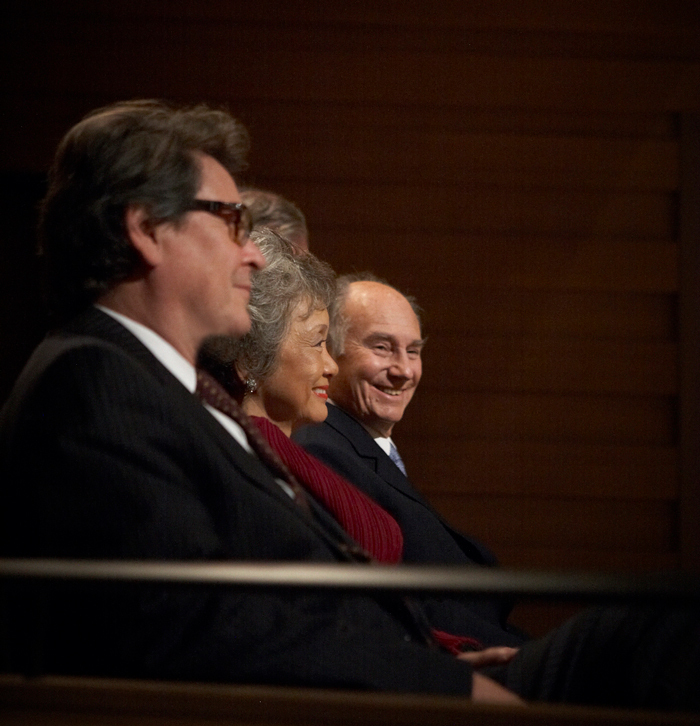 Dr. Peter Simon, The Right Honourable Adrienne Clarkson, and His Royal Highness The Aga Khan. 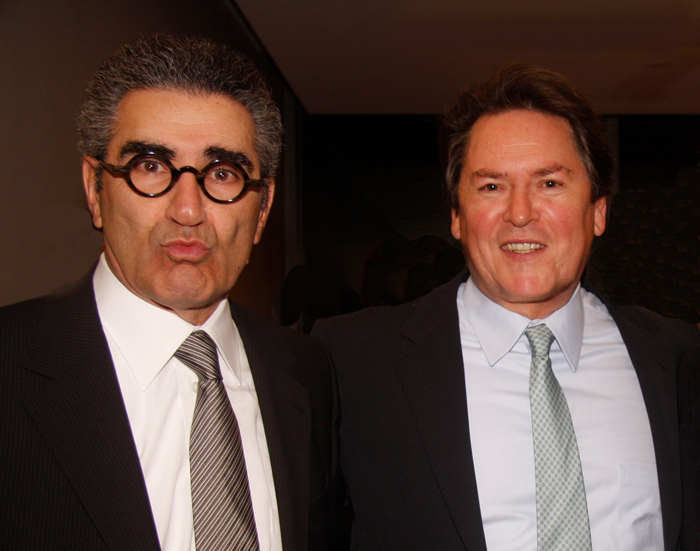 Eugene Levy with Dr. Peter Simon. 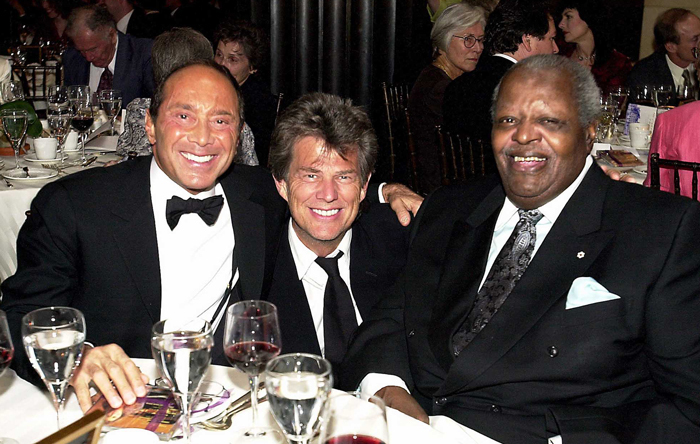 Paul Anka with Royal Conservatory alumni David Foster and the late Oscar Peterson at the 2002 Royal Occasion. 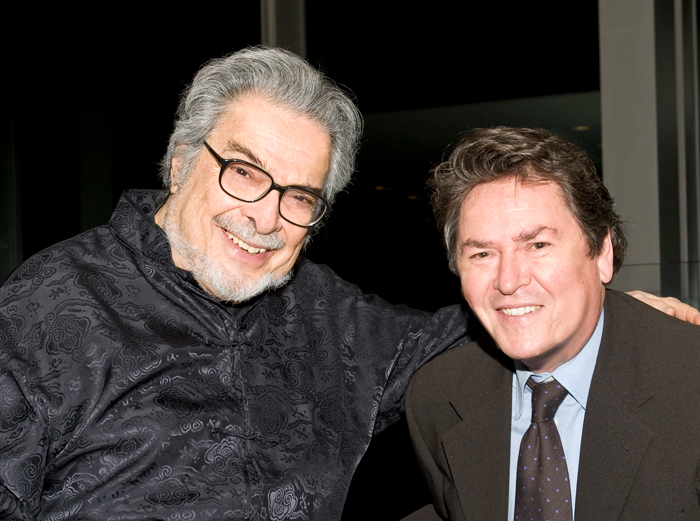 Leon Fleisher with Dr. Peter Simon. 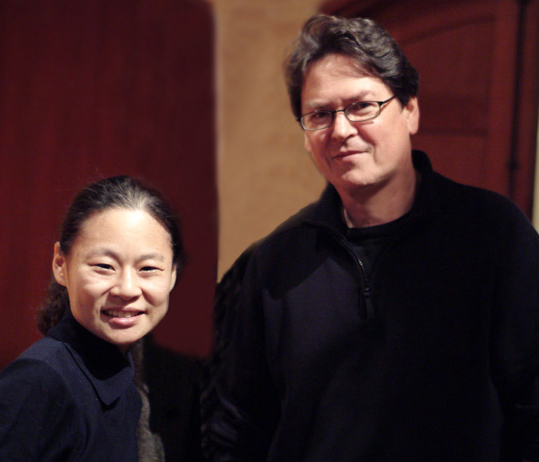 Midori with Dr. Peter Simon. 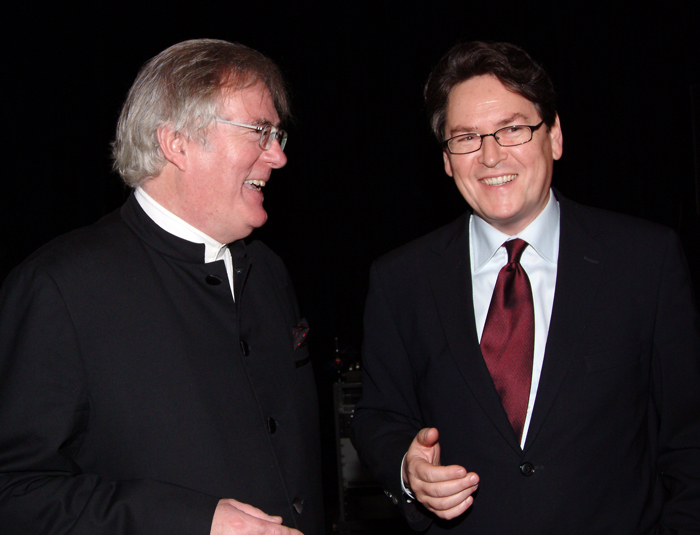 The late Richard Bradshaw with Dr. Peter Simon. 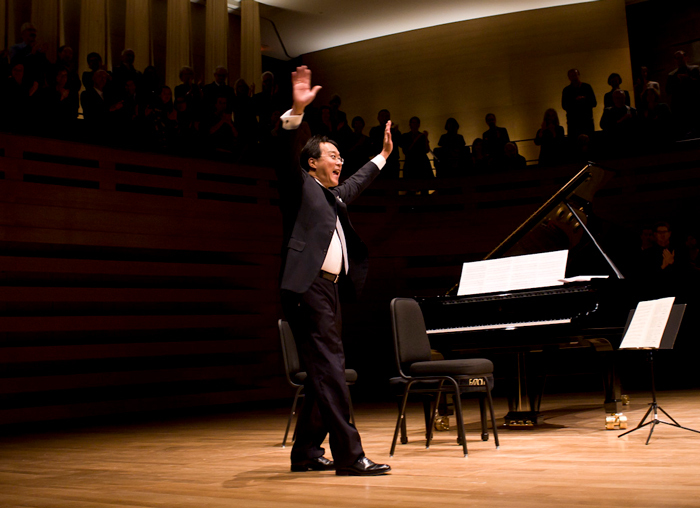 Yo-Yo Ma in performance at Koerner Hall. Left: Dr. Peter Simon with legendary hockey player Frank Mahovlich and Marie Mahovlich Right: David Thomson, Angela Elster, and Dr. Peter Simon following the launch of The Marilyn Thomson Early Childhood Education Centre. Left: Dr. Peter Simon (centre) with Emmanuel Ax, Yo-Yo Ma, Isaac Stern, and Jaime Laredo at The Royal Conservatory in February 1994. 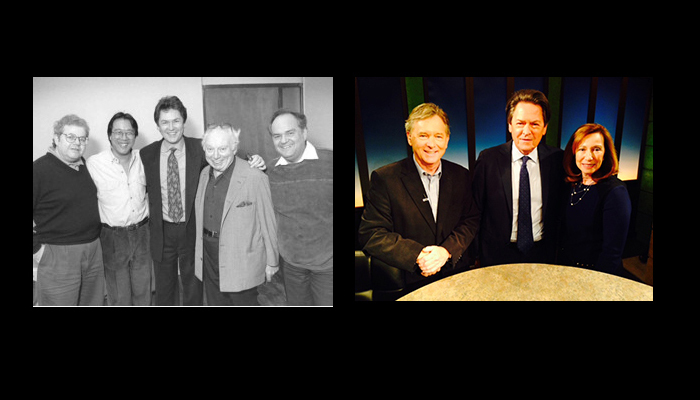 Right: Dr. Peter Simon appears on Toronto Files with hosts Helen Burstyn and Jim Deeks. 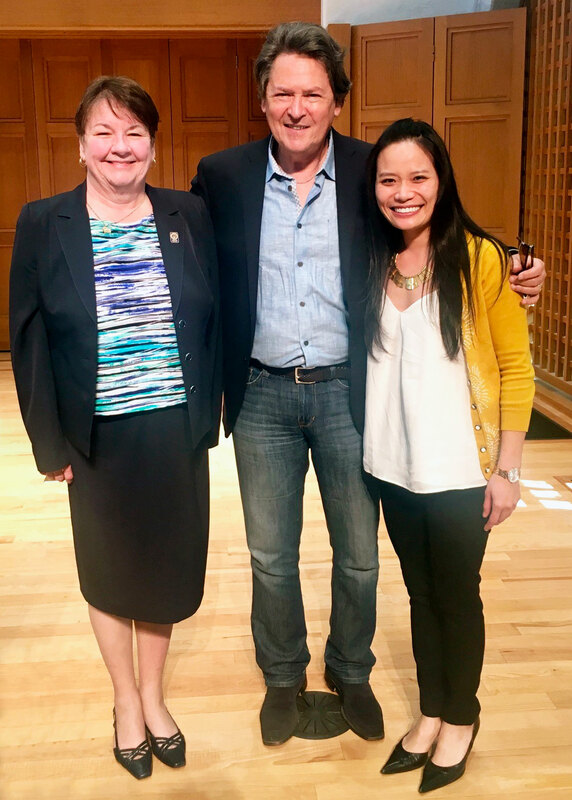 Dr. Peter Simon with Elaine Rusk and Dr. Ruby Wang, from the Pasadena Conservatory of Music. In 1997 Dr. Simon launched The Glenn Gould School in order to establish a highly focused performance training entity in Canada for exceptionally gifted musicians. Named in honour of The Conservatory’s most acclaimed alumnus, The Glenn Gould School has emerged as one of the most outstanding performance training institutions in the world. With a limited enrollment of 130 students, many of whom are on a full scholarship program, The Glenn Gould School offers a highly enriched environment in which the development and artistic growth of each student is guided closely by teacher mentors. Each year students are brought into contact with a wide range of international artists, many of whom perform in Koerner Hall. Faculty of the Glenn Gould School include acclaimed artists and teachers such as Leon Fleisher, Andres Diaz, Paul Kantor, John O’Conor, John Perry, and Frank Morelli. Recent graduates include 20-year-old Deutsche Grammophon recording artist and internationally acclaimed pianist Jan Lisiecki. In 2013, the young artists programs were restructured and renamed as The Phil and Eli Taylor Performance Academy for Young Artists. Each year 90 highly gifted young musicians between the ages of 9 to 17 are mentored and trained by the RCM’s leading faculty. In 2016, an alumnus of the Academy, 16-year-old Tony Yang, became the youngest Prize Winner in the history of the Chopin International Piano Competition in Warsaw. In 2003 the RCM launched The ARC Ensemble, a chamber music group consisting of seven members of the RCM faculty. The ARC Ensemble has since developed into one of Canada’s leading cultural ambassadors performing throughout North America, Europe and Asia. Three of the CDs recorded by ARC were nominated for Grammy Awards. The ARC Ensemble has also played a major role in researching and performing works of music lost through The Holocaust. The Music in Exileseries has been presented in London, New York, Washington, Warsaw, and Budapest. Recently ARC released its fifth CD featuring the music of Jerzy Fitelberg and performed at London’s Wigmore Hall the Concertgebouw in Amsterdam, The Kennedy Centre, and at the Lincoln Centre Summer festival. In 2005 Dr. Simon initiated a landmark capital project that would lead to the construction of a new home for the RCM. With the completion of the Telus Centre and Koerner Hall, The Royal Conservatory was able to occupy a unique hybrid facility of 200,000 square feet that served both educational and broader cultural purposes. The project included the restoration of a heritage site which was integrated with two transparent, accessible, and technologically up-to-date contemporary buildings. The centerpiece of the project was Koerner Hall, a concert space sculpted for an optimal acoustical environment and regarded by many leading artists as one of the finest halls in the world today. The new facility occupies an important site in the city of Toronto and has served as an anchor to the development of a new cultural precinct. 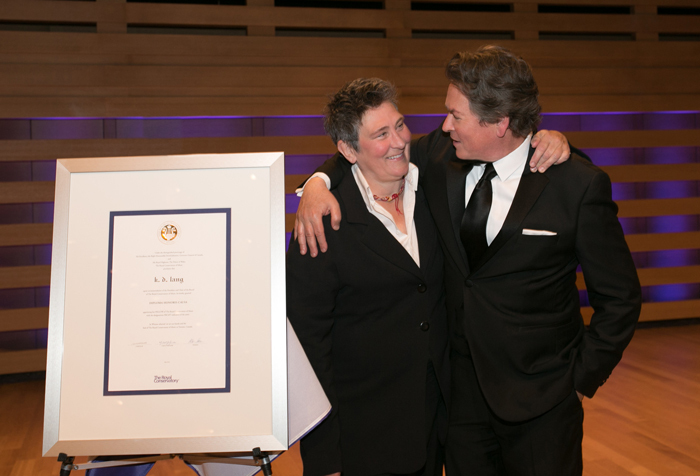 In 2009 with the opening of Koerner Hall, Dr. Simon established a new Performing Arts Division which presents and oversees more than 300 concerts and events a year. The Performing Arts Division operates one of the most successful concert series in North America, presenting many of the worlds greatest performers in a variety of musical genres including: Valery Gergeiv, Yo Yo Ma, András Schiff, Wynton Marsalis, Anoushka Shankar, the Buena Vista Social Club, and Chick Corea. 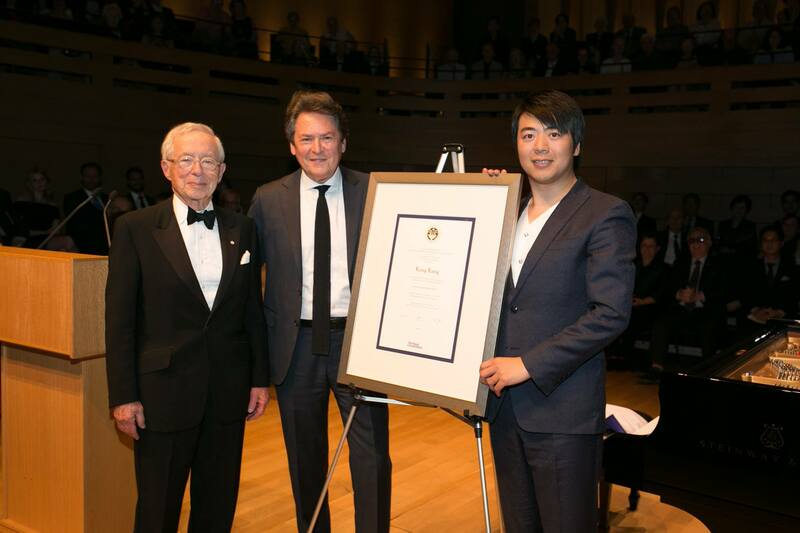 Over 150,000 individuals attend events at Koerner Hall each year, making The Royal Conservatory an important cultural destination point in the city of Toronto and the Ontario region. In 2013 The RCM launched The Marilyn Thomson Early Childhood Education Centre to develop and deliver innovative early childhood education programs and digital products for use in the home and classroom by parents, children, and teachers. Drawing on a foundation of neuroscientific research and working closely with the RCM’s own Research Centre, the Marilyn Thomson Centre is focused on giving children an enhanced educational experience and promoting cognitive and social development through music and the arts. Dr. Simon’s concern with the decline of music and arts programs in public schools and the level of participation in music study and in Canada and the United States led to the development of a number of curricular initiatives aimed at young music students and independent studio teachers. The RCM recently launched a Teacher Certification Program aimed at ensuring high standards in independent teaching and equipping new music teachers with the tools to build successful studios. In 2016, the RCM launched a Teacher Portal which offers an array of online tools and services for the benefit of its 25,000 system users. Building on the reputation of excellence of The Royal Conservatory in the fields of curriculum development, publishing, and assessment, Dr. Simon formed a partnership with Carnegie hall in 2010 to create a curriculum and assessment standard in the United States. Dr. Simon believed that such a structured system and standard would motivate students to greater levels of participation and help to unify independent music teachers and music schools across the United States into a more powerful voice for the role of music in personal and social development. Then called The Royal Conservatory Music Development Program, and under the sole management of the RCM, the structured curriculum and assessment model has been adopted by more than 100 schools, 6,000 independent teachers, and approximately 10,000 students. Our supporters are helping create a society in which the arts are catalysts for achievement, pathways to self-exploration, and bridges to mutual understanding. As a means to secure investments for the future development of The Royal Conservatory, Dr. Simon initiated the first Development function of the institution in 1992. This area has subsequently grown into a mature department serving a large donor community consisting of several hundred supporters. 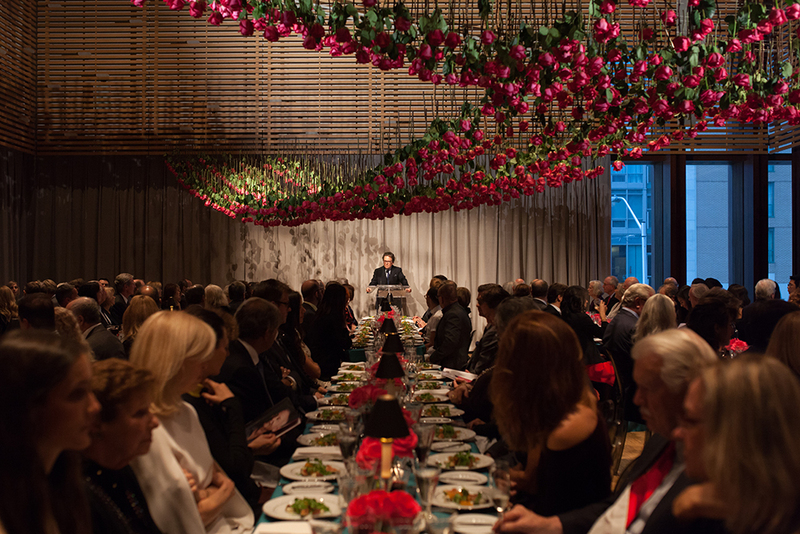 Over $300 million has been raised to fund the expansion of Conservatory programs and capital initiatives. Annual revenues of the RCM have grown from $11 million in 1992 to $46 million in fiscal 2016. Of this total 5% are from government sources – 20% from annual donations and 75% are earned. 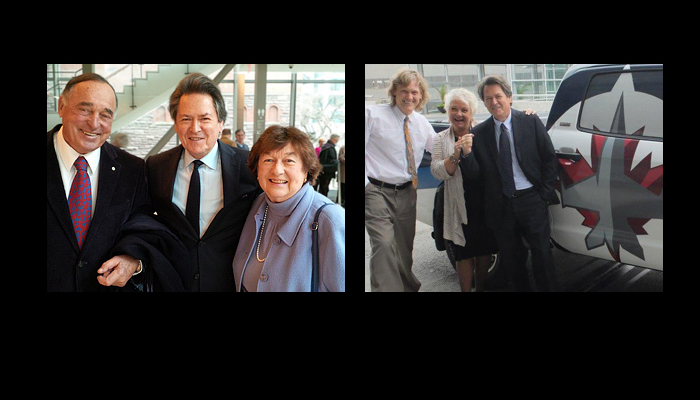 Dr. Simon began his relationship with The Royal Conservatory as a student of Boris Berlin. He went on to study at New York's Juilliard School and in London with Louis Kentner. 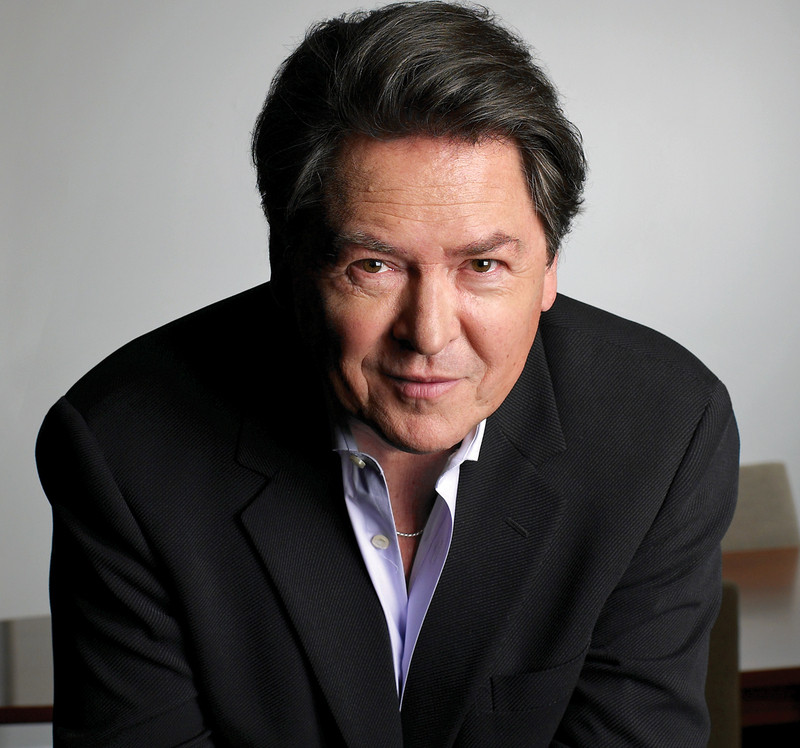 In 1983, Dr. Simon received a Doctor of Musical Arts Degree from the University of Michigan in Ann Arbor studying with the legendary pianist and conductor Leon Fleisher. He subsequently divided his time between performing, teaching at the University of Western Ontario, and overseeing the artistic direction of Preview Concerts in Toronto. In 1986, Dr. Simon joined The Royal Conservatory as Director of Academic Studies where he was instrumental in planning and implementing a series of post-secondary programs, which led to the rebirth of The Royal Conservatory of Music Professional School, now known as The Glenn Gould School. He also instituted regular classes by internationally acclaimed artists including Leon Fleisher and Jaime Laredo and supervised the compilation, editing, and recording of the Celebration Series of piano publications which have been used by hundreds of thousands of Canadians. 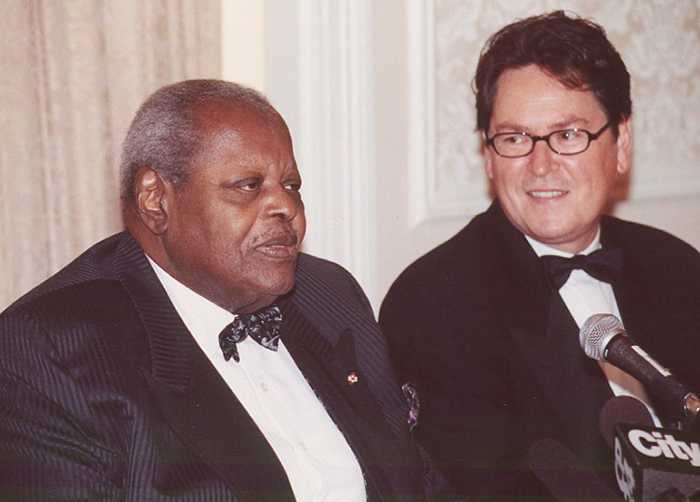 In 1989, Dr. Simon was appointed President of the Manhattan School of Music in New York City, where he initiated several key projects. In the area of programming, he introduced the first Master of Music Degree Program in Orchestral Performance in the United States and appointed the concertmaster and principal players from the New York Philharmonic as members of the faculty. Dr. Simon’s contribution to the school also extended to the area of fundraising, where he persuaded internationally acclaimed artists such as Victoria de Los Angeles and Shura Cherkassky to give benefit concerts. Under his leadership, the Manhattan School of Music began a physical plant renovation program and introduced new promotional materials and activities that led to a significant increase in the number of annual applicants. Dr. Simon chaired the Arts Education sub-committee of the Minister’s Advisory Council for Arts and Culture, an agency of the Ontario Ministry of Culture. 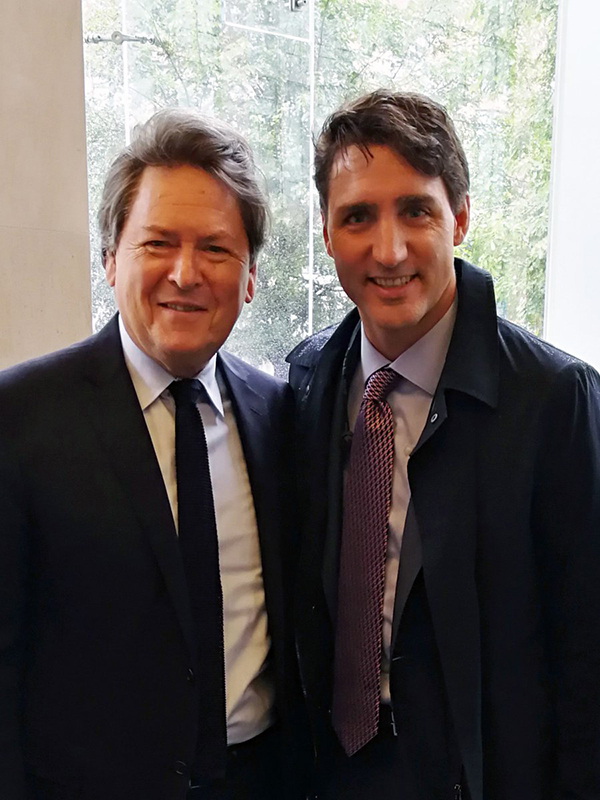 He was honoured by the Salute to the City awards for his contributions to education in Toronto and has received an Urban Leadership Award from the Canadian Urban Institute. 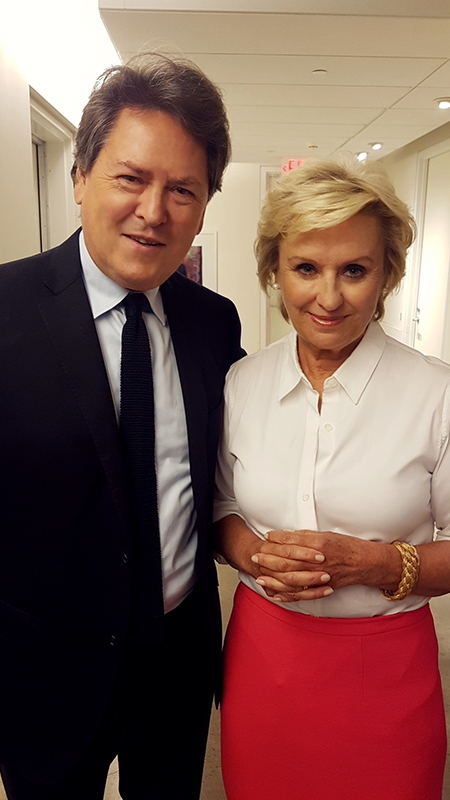 In 2006, as part of a series of special events commemorating the 50th anniversary of the Hungarian Uprising, Dr. Simon was acknowledged as one of 50 prominent Hungarian-Canadians whose contributions to creativity and innovation in Canada were celebrated. Dr. Simon is married to the Canadian pianist Dianne Werner. They have two children, Nicole and Justin.